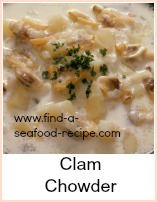 Chowder is another name for soup or stew - it tends to be left a bit chunky (although some can be blended smooth if you prefer) but overall, it's a one pot complete meal with the addition of some crusty bread to mop up the juices. 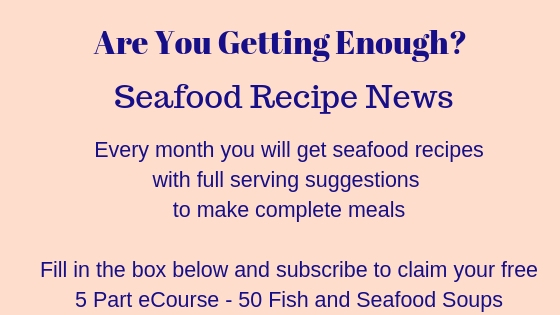 A different mix of fish will give you different tastes - experiement by adding some shrimp and smoked fish to make up the total for the recipe - your choice. The stock can be either using a cube or the trimmings of any fish you have. Just simmer the trimmings for about 30 minutes, strain and use immediately. Do not overcook the stock as it can become bitter - 30 minutes is maximum and don't leave it for long without straining. Heat the oil add the bacon and fry until crisp. Remove and reserve the bacon and pour the oil into your soup pan. Fry the onion until softened. Add the potatoes and stock and simmer for about 10 minutes. Add the white fish and cook for a further 5 minutes. Add the prawns and sweetcorn and cook for another couple of minutes. Pour into bowls, add a dollop of cream and sprinkle chopped parsley on top. This is excellent served with crusty bread. 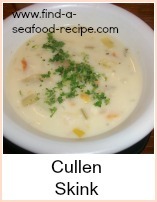 Use 1 1/2 lbs (675g) of a combination of white and smoked fish and 4 oz prawns (shrimp). The method is the same as the above. Remember to add the prawns (shrimp) for only the last couple of minutes or they will overcook and become tough. Skin and bone the fish and cut into strips. Put the fish trimmings, water, lemon rind, salt and pepper into a pan. Simmer for 30 mins, then strain. In another pan, fry the bacon until the fat runs. Add the onion and cook gently. Add the potato and coat in the fat. Sprinkle in the flour and stir well. Gradually add the hot strained stock, stirring all the time and cook for about 25 mins. Add the fish and cook a further 5 mins. 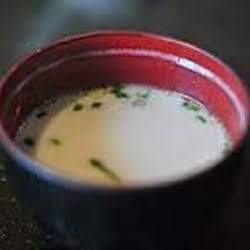 Heat the milk and butter and add very carefully to the soup when the potatoes are soft. 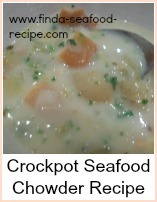 Three fabulous seafood chowder recipes, mixed, shrimp and corn, smoked fish - all delicious and will have you mopping out the bowl with bread to get the last little bits.